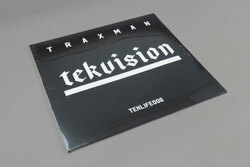 Traxman - Tekvision. Vinyl LP. Bleep. The Chicago legend returns with another LP of top-shelf footwork. Tekvision is a testament to both his long history in the Midwest scene and his music’s consistent innovation. The tracks on Tekvision are not as silky as that of Teklife affiliates like DJ Spinn, nor as turbulent as those of someone like Jlin. Instead they operate in a middle-ground that is true to their footworking roots while allowing them to examine their samples from all angles. As such we get aquatic workouts like DJ Earl-collab ‘Be Gagen’, ghetto house odysseys like ‘Drop It Down’ and ‘Gone Girl’, and the frantic sampledelia of the album’s midsection. While Traxman will need little introduction to anyone with a passing knowledge of all matters 160 bpm, there are few better places from which to dive into the producer’s sprawling catalogue.